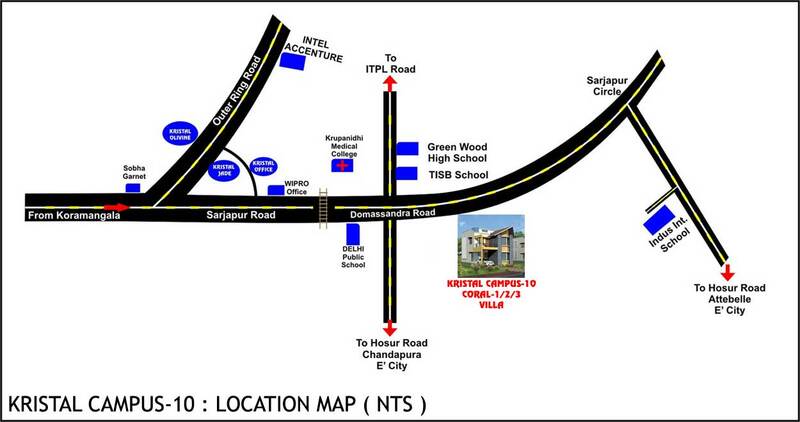 2 and 3 BHK Deluxe Apartment with in the Campus 10 which contains villas and ready to use Club house. Doors Main Door: Teak wood frame and teak wood shutter with Polish on both sides; B & R or equivalent lock with SS fittings and stopper. 4" skirting. Ceramic flooring in Toilets . Toilets Ceramic tile dadoing of 7� height , Concealed CPVC/PVC/GI pipe lining with Marc / Equivalent brand CP fittings and Cera brand white color ceramic fittings. Wash basin (without pedestals). well, Staircase, Electrical Room, Generator Room, Sump, Transformer etc. bedrooms & chimney point in Kitchen). Water supply Overhead tank provided with Concealed PVC/GI/PPR pipeline along with BWSSB Water line provision in kitchen. Intercom Intercom facility to all flats and security (Instrument @ extra cost).